Save $131 on Registration to the 2019 Heartland Travel Showcase! As summer heats up and the group tour market continues to do the same, make Heartland Travel Showcase part of your business growth strategy for 2019. As one of the largest regional group tour marketplaces in the U.S. in its 34th year, Heartland Travel Showcase (HTS), anticipates a successful and energizing event in Detroit, MI, Feb. 22-24. With its unmatched destinations and potential tour product, Heartland Travel Showcase is filled with sellable group ideas in Illinois, Indiana, Iowa, Kentucky, Michigan, Minnesota, New York, Ohio, Pennsylvania, Tennessee, West Virginia, Wisconsin and Ontario. With a compact show schedule, 68 targeted appointments, popular Four Minute Meet, open tradeshow sessions, and plenty of networking opportunities, Heartland Travel Showcase provides the opportunity for tour operators to discover exceptional group product in a focused manner. The show has “heart!” The warmth of the region is often experienced first-hand at Heartland Travel Showcase. An intimate setting, attention to detail, and an atmosphere that transforms colleagues into friends, are just a few of the reasons why operators return year after year. 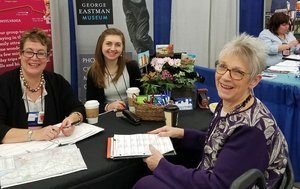 Did you know that tour operators who attend Heartland Travel Showcase, on average, experience $36,700 in booked business resulting from the show in a given year? Take advantage of the early bird tour operator registration rate and save $131 (available through Oct. 31) as you get your share of the more than $23 billion spent directly on group tours in the heartland. For only $99, you’ll have the opportunity to dramatically grow your business, build relationships and see a demonstrated return on your investment. To learn more about Heartland Travel Showcase and register today, click here. Questions? Contact Karen Eylon at keylon@ohiotravel.org or 614-572-1931 or toll free at 800-896-4682. Join in the Heartland Travel Showcase conversation on Twitter at @OhioTravel, Facebook at Heartland Travel Showcase, and on Instagram at HeartlandTravelShowcase!